Christmas is almost here, and what better way to celebrate the holidays than by adding a little BurgerCat to your life?!? 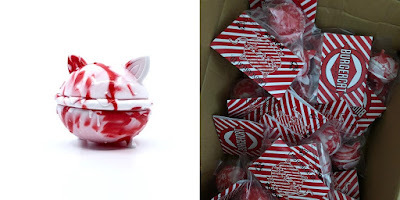 For their fourth BurgerCat colorway, Nathan Hamill and Science Patrol have teamed up with Pobber to release the deliciously sweet CandyCaneCat Edition. Merry Catsmas!!! The Cat puns never get old with this delicious looking vinyl figure that mashes-up a cat with a hamburger. 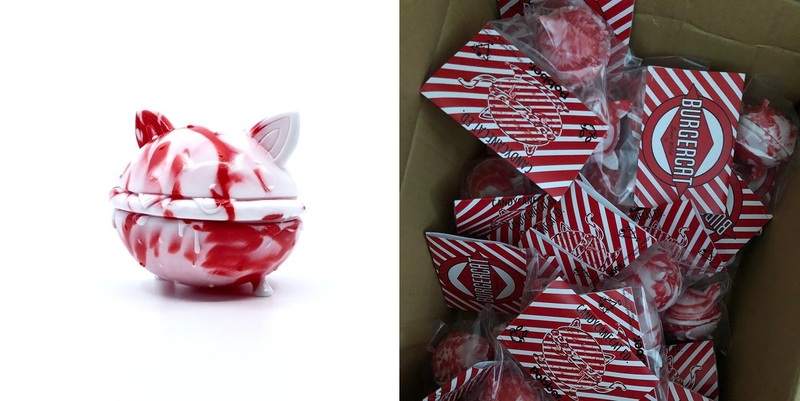 The Christmas inspired BurgerCat CandyCaneCat Edition Vinyl Figure by Nathan Hamill x Science Patrol is cast in marbled red and white soft Japanese vinyl and stands 2.75” tall. This unpainted figure is limited to just 30 pieces and will go on sale at 9am EST today, Tuesday, December 4th, at the Pobber online store for $30. Each figure comes bagged with a colorway specific header card.